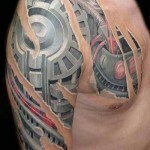 Biomechanical tattoos are among the most interesting of subjects and a talented artist can render an image that is truly awe-inspiring. 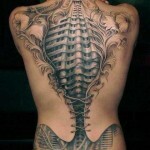 They first emerged and started seeing an increase in popularity in the 1980s, and have become more intricate and detailed over time. 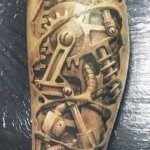 Today, biomechanical tattoos are more popular than ever, owing in no small way to the advent of the information age, the rise in popularity of Steampunk and the ever-increasing attention within society to all things electronic. 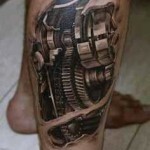 Biomechanical tattoos depict mechanical parts integrated into the workings of the human body and often show a picture of what is perceived to be the inner-workings of muscle groups and biological systems replaced with mechanical gears, pistons and other metallic devices. 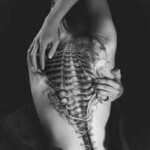 Images of torn flesh reveal not muscles, veins, arteries and organs, but instead an intricate network of biomechanics, almost always unique to the individual in appearance. 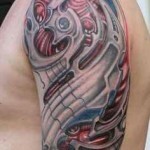 The earliest biomechanical tattoos were almost exclusively black and grey, but more often now, people are choosing to integrate more color and definition into the designs. 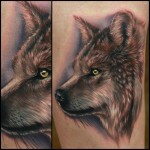 Adding color can provide greater detail to the image and make it look that much more diverse. 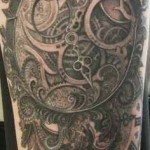 Since the nature of biomechanical tattoos is one that attempts to reveal the workings of an entire muscle group or system, most wearers opt for larger designs: full- or half-sleeves or designs that cover larger areas like thighs, calves, chest or back. 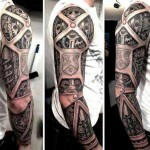 Smaller designs are workable, however, and can have the same kind of impact. 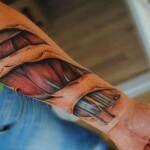 Sites for smaller subjects include joints like wrists, elbows, knees and ankles. 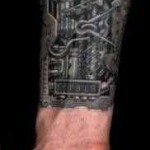 Because of the intricacy of design of these tattoos, you want to choose an artist who has an extensive portfolio that showcases his or her experience creating quality biomechanical images. 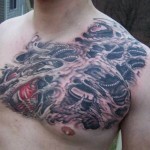 A clear advantage of checking out your artist’s past work ahead of time is that it will give you a better idea of how you want your tattoo to look. 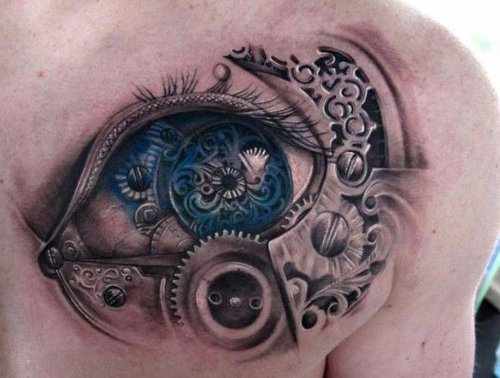 You will be able to see various images and elements on someone else before you decide it’s what you want for your own design. 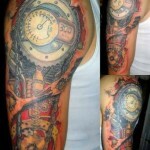 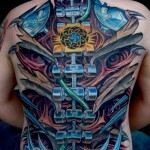 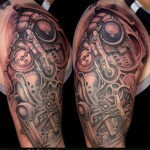 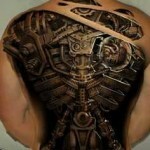 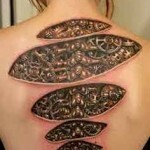 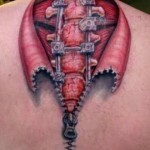 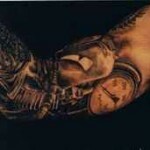 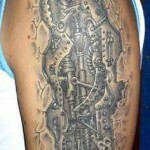 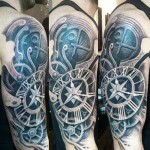 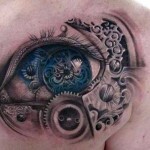 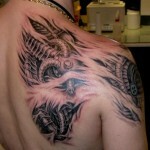 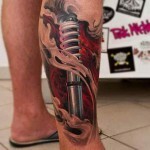 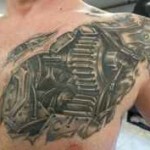 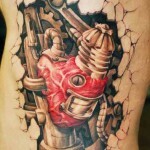 The most appealing part of a biomechanical tattoo has to be its purely individual nature. 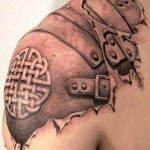 While certain elements may be present in other pieces, by and large, your tattoo is going to be totally unique in its design. 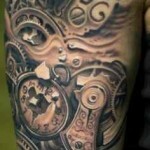 There really is no better ink that ink that’s all your own so, from the standpoint of individualistic expression, you can’t go wrong with biomechanical themes.